equation y = mx + b or f(x) = mx + b.
and determine the slope and the y-intercept. 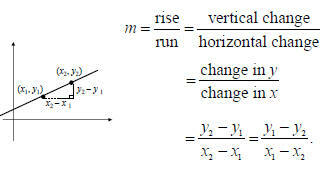 •Solve applied problems involving slope. 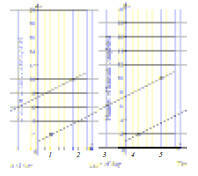 described by f(x) = mx + b.
using the same set of axes. For each equation, find the y-intercept. a) y = −3.1x + 7 (0, 7) is the y-intercept. (0, –9) is the y-intercept. and (7, 5) and find the slope. line given by 4x − 7 y = 2. 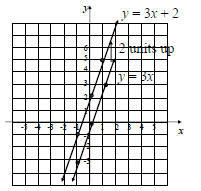 The slope is 4/7 and the y-intercept is (0, –2/7). Some applications use slope to measure the steepness. Slope can also be considered as a rate of change. Find the slope (or grade) of the treadmill. The grade of the treadmill is 7.6%. ** Reminder: Grade is slope expressed as a percent. displaying data from a recent day of work. b) What is that rate?